Chun Mei Nickles didn't let hip surgery dash her hopes of competing in track at USC . Chun Mei Nickles' goal in the Pacific-10 Conference track and field championships last weekend was to clear at least 13 feet in the pole vault event and earn points for the Southern California Trojans. She had to settle for a 15th-place finish with a vault of 11 feet, 534 inches. Nickles will have one more chance this season at the NCAA West Regional at Eugene, Ore., May 25-26. 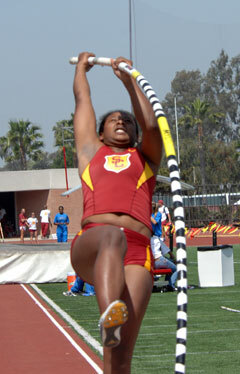 Nickles' personal record is 12-5 1/2, set at the UC San Diego Triton Invitational on April 21. Her mark tied Shannon Lewallen for the fourth-highest jump in school history. It is a validation of Nickles' courage and perseverance that the 2003 Mililani High School graduate is still competing in the sport. To compete again was the primary motivation that drove Nickles through tough times after she was diagnosed with hip displeasure in both hips during her freshman year at USC. Nickles had corrective surgery on the left hip at the end of her freshman year, then had the same surgery on the right hip during Christmas break of her sophomore season. The regimen was the same after each surgery. "The first three months were no weight-bearing. I was on crutches or in a wheelchair if I was really tired," Nickles said. "Then I was in rehab for three months after that. "My goal was to participate in track again. I knew I would make it. It was hard. There were times where I couldn't see the end of the tunnel." Nickels credits the support from friends and her younger sister, Mei, with cheering her up and taking her place during her year of rehabilitation. "Chun Mei has gone through trials and tribulations," said USC coach Ron Allice. "A lot of her strength is to her ability to overcome some non-idealistic situations." Hip surgery couldn't stop Chun Mei Nickles from fulfilling her dream of competing in track and field for USC. Nickles competed in sprints, the 100 hurdles, relays and the pole vault at Mililani. She considered Oregon, Washington and Whitworth, but USC had been her first choice for a long time. "I knew that I wanted to go to USC after visiting the campus during the summer between third and fourth grade when my older sister (Diana) was there," Nickles said. "I did not make an official visit. The coaches weren't aware of me at all. I just walked on in the fall." Nickles, short the required course credits to compete for the Trojans last year, competed unattached. But it wasn't until last August that she had her final surgery to remove three pins from each hip. "There was a feeling of finality. I was done with surgery," Nickles said. "I'm back to 100 percent. "I went through a small depression stage. My grades plummeted a little while I was trying to get my life back on track. At this point in my life I feel that I can do more. It's time to push harder." Nickles chose to compete in the pole vault at the college level because she felt that was the only event in which she really had a chance to excel. She still has goals to achieve. Although she is listed as a senior on the USC roster, Nickles expects to receive a medical redshirt year and compete again next spring. To prepare for her event, she will watch a pole vault movie at her apartment, then sit and try to visualize herself going over the bar. "I'm going to stay here this summer and train," Nickles said. She will graduate next May with a degree in kinesiology and plans to pursue a career as a physical therapist. Notes: Mei Nickles (Mililani '04), a junior who competes in jumping events for USC, redshirted this year. She suffered a stress fracture in her right shin and has an inflamed left knee due to loss of cartilage. ... Maya Coelho (Kamehameha '06), a high jumper, is redshirting with an ankle injury. 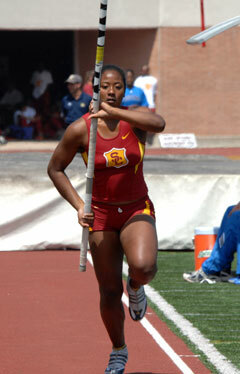 ... Jasmine Knight (Kamehameha '06) has competed in the pole vault.